The Great Pyrenees guard dogs on patrol look menacing—necks adorned with collars bearing sharp metal spikes. Beyond the hilltop and down the ridge gathers a band of fluffy, untroubled sheep—in sharp contrast to the alert and muscular dogs assigned to their protection. Our truck meanders slowly up the hill and over dry clods of dirt and bristly sagebrush until it slows to a stop just over the crest and we enter a scene reminiscent of the Old West. To our left sits a large covered wagon and in its shadow stands a horse. Both are owned by Ernesto Onihuela, the Peruvian herder who oversees the 900 sheep we are about to bed down with for the night. For generations local ranchers have relied on the abundant native grasses and shrubs blanketing the hills and valleys of Idaho’s picturesque Sawtooth Mountains to sustain their sheep through the summer grazing season. But even more dependent on the habitat are resident bears, mountain lions, coyotes and—for the past decade—America’s gray wolves. The wolf’s reintroduction has restored balance to Idaho’s wilderness by keeping overgrazing by elk and deer in check. But for livestock owners, who have grown accustomed to a land devoid of its native top predator, it brings concerns. From early June until late October livestock owners move more than 11,000 sheep through more than 170,000 acres of land in and around the mountains. But the sheep associated with the three major producers who are part of Defenders’ Big Wood River Valley project—Lava Lake Land and Livestock (which employs Oniheula), Faulkner Land and Livestock, and Plateau Farms—get some added protection. While it does not turn all livestock owners into wolf fans, the project at least promotes peaceful coexistence and gets them thinking about ways in which they can live with wolves in the long-run. Defenders’ project employs three field technicians, who use a variety of tools to keep wolves and sheep safely apart each night. This evening, Jesse Timberlake, Defenders’ Wood River project manager, has already erected the sheep’s night corral using solar-battery-powered electric fencing and fladry—red flags tied to the wires, a proven Old World technique that scares off wolves. The livestock guarding dogs flank the sides. “I’m just here to try and keep sheep alive in wolf territory,” says Rodger Olson, one of the project’s field technicians, as another technician sets up a large spotlight farther down the ridge. “If I can do that, I can keep the wolves alive.” Olson and other project participants know government officials are empowered to kill wolves that repeatedly prey on livestock. At dusk Timberlake, waving an antenna from left to right, begins checking for signals from the two radio-collared wolves in the resident Phantom Hill Pack. “I do this every hour, on the hour,” says Timberlake. “If it starts making noise it means a wolf is somewhere within a hundred yards of us.” He then does a once-over of the fladry corral, ensuring that the rectangular flags hang about six inches from the ground so that the sheep won’t jump over it or graze under it. Meanwhile, Onihuela regales us with stories of a bear sighting the night before—right on the ridge where we are standing—and of the dogs chasing three curious black wolves down into the valley earlier that morning. When the horizon fades in the day’s last light and stars began to illuminate the cloudless sky, all grows still and silent except for the bugs swirling around my flashlight—and the sound of 900 grazing sheep. As I settle-in for the night between sagebrush bushes, Onihuela’s stories weigh heavily on my mind. The silence is unnerving, interrupted only by the snorts of sheep that—to my untrained ear—sound like bear grunts. But as the night wears on, I take comfort in other sounds: a snoring guard dog, the click of a flashlight and the soft static of the radio as Timberlake searches for a wolf’s signal. In the pre-dawn darkness, the Phantom Hill pack’s howls waft up with the breeze from the valley below, and the sheep shuffle closer together inside their electric pen. For tonight, a tenuous peace remains in place between livestock and predators—and ranchers and wolf proponents, and I know that they—and I—can rest easy under the watchful eyes of those who keep the peace. Wolves across the country are in danger of disappearing from the wild. 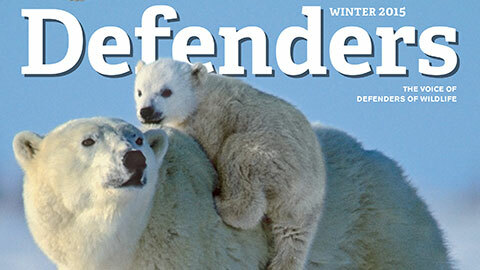 Learn more about Defenders' Campaign to Save America's Wolves.